Leftist front-runner Andres Manuel Lopez Obrador of the National Regeneration Movement (MORENA) attends an event organised by Mexican Employers' Confederation (COPARMEX) in Mexico City, Mexico May 17, 2018. Reuters: What is next for Mexico City airport after mega project axed? 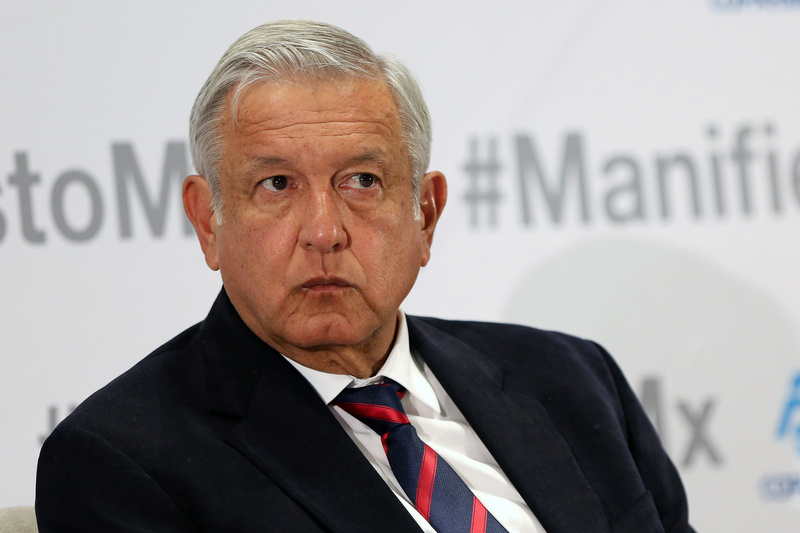 Mexican President-elect Andrés Manuel López Obrador indicated on Nov. 9 he would not support a bill put forward by his party to limit bank commissions, after its unexpected proposal by senators in his National Regeneration Movement drove Mexican stocks to their lowest level since February 2016. Mario Delgado, a senior party lawmaker, pledged that the incoming government would act with more prudence in the future. López Obrador, who takes office on Dec. 1, said on Oct. 29 his government would cancel construction of a partially built $13 billion airport for Mexico City, heeding the results of a four-day informal referendum that called for abandoning the project. About a million people, or some 1 percent of Mexico's electorate, took part in the public consultation, which was organized by López Obrador's party, not the national electoral authority. After his announcement, the peso recorded its heaviest one-day loss since the election victory of U.S. President Donald Trump in November 2016.